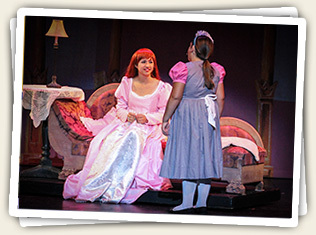 Alana Schick, in the role of Ariel, finds out about her true love from Cassie Gonzalez in the role of Carlotta. Alana is currently attending Coronado School of the Arts. We encourage you to visit our photo gallery to see evidence of the marvelous musical productions that have been staged by Mt. Helix Academy under the direction of Ms. Michelle Foggiano and produced by Mr. Robert Meehan with the assistance of Ms. Mary Taylor and a host of Mt. Helix Academy parents. Currently in production is “The Lion King, Jr”, under the direction of Marisa Musgrove. Last year’s production, which played to rave reviews at the Ray and Joan Kroc Community Center, was “Peter Pan.” Previously, we produced“Annie Get Your Gun,” “The Sound of Music,” “Annie,” “Beauty and the Beast,” “Aladdin,” “Joseph and the Amazing Technicolor Dreamcoat”, “Seussical”, and “Peter Pan”. 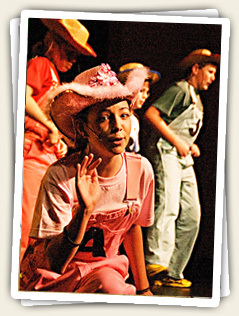 Bailey LaFlam in scene from Joseph and the Amazing Technicolor Dreamcoat production by Mt. Helix Academy. In addition, each year Mt. Helix Academy also stages two music performances, including our Winter Concert and our Spring Concert. Both are opportunities for our Kindergarten through 5th grade classes to show off what they have learned, including their amazing stage presence.